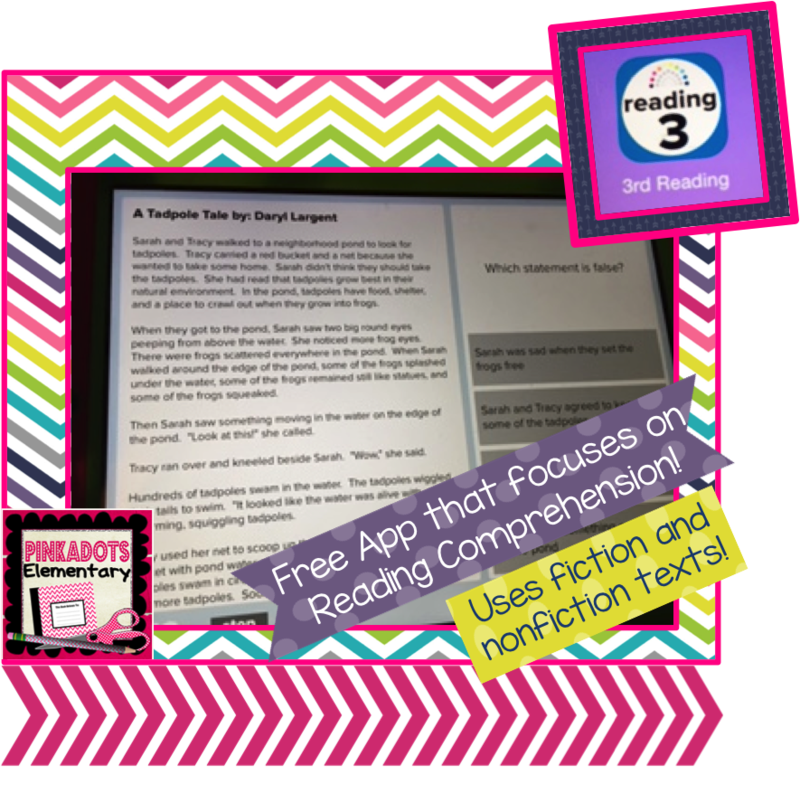 Pinkadots Elementary : FREE Reading Comprehension App! Did you ever find an awesome app that you love and want to share it with everyone you know? Well this summer I randomly came across a great app that was free for the day. I used it often in my fourth grade classroom and don't be turned away by the name because it is definitely appropriate for 3-5 students. I was super excited to find out today that it is back to being free. I don't know why or for how long, but all I know is you need to grab it and fast! I think it is normally $2.99, but still a steal for everything it does! As you can see in the picture above, the app is called "3rd Reading". There are other apps for different grades in a bundle, for 4th and 5th, so if you like this, that might be an option if you wanted to spend money. 3rd Grade Reading Comprehension, from Peekaboo Studios, offers ten reading comprehension passages with ten or more questions keyed to each. Questions range from rote comprehension to inference, vocabulary, summarizing and sequencing tasks. The app is simple and straightforward. It will provide reading comprehension practice. As soon as a student chooses an answer, the app tells the student if it is correct or not. If it is not correct, the app shows the student in the text where the answer was found. It is a great way for students to go back and reread for the correct answer choice. My students love using any type of technology in the classroom, so during reading time, I have no problem letting a few students work on this app. It keeps them engaged in their work and they love knowing their score right away. Thanks for sharing this! I know my kiddos can always use the extra help! I love it when other teachers share apps that work in their classroom. I work with K-2 students but I'll definitely buy it since it's free to get a better understanding of it. Thanks for sharing this opportunity!